Holy Bible Mosaic, New Living Translation, Tyndale House. How about that(?)! While I was writing my last post about the release of Holy Bible Mosaic, the mailman delivered my copy courtesy of Laura Bartlett at Tyndale House, and let me tell you it's gorgeous. I will be conducting a Q&A with Paul Louis Metzger, a contributor to Holy Bible Mosaic who wrote the article for Pentecost Week 15 on the topic of Justice. How appropriate is that for a Bible blog hosted by a lawyer? 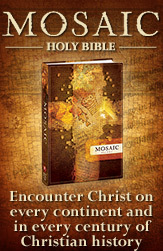 I will post my review of the Holy Bible Mosaic. I will be giving away a certificate for a free copy of Holy Bible Mosaic redeemable at any bookstore, and anyone can win. All of these are, of course, subject to change, but I will keep you posted.